In a rolling landscape dominated by farms, Quaggy Joe Mountain presents a prominent profile. 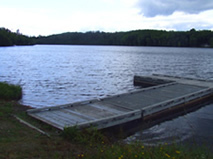 Alongside it lies Echo Lake, a popular brook trout fishery and swimming destination. 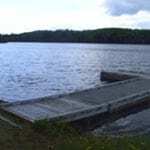 Both these recreational resources lie within Aroostook State Park, the first state park ever created in Maine (in 1939). The Park, just five miles south of Presque Isle, draws area residents year-round to enjoy beach picnics, camping and hiking in summer and cross-country skiing, snowshoeing and snowmobiling in winter. With a grant from LMF, the Maine Department of Conservation was able to expand Aroostook State Park by purchasing at a bargain sale price a 93-acre parcel owned by the U.S. Department of Transportation. The addition enhances the park’s recreational capacity, a significant resource in an area with little other public land. DeLorme Maine Atlas and Gazetteer Map 65, E-1. From Presque Isle, take Route 1 south approximately 4 miles, turning right on Spragueville Road. Take the second left, which ends in the Park. Camping reservations for the park can be made online.